Shortly after I reviewed the prodigious Dutch newcomers NovAct, another debut album from a young Dutch band popped into my player. I tell you, I still can’t believe the number of bands and the excellence in quality that the metal world is receiving from this small Western European country; just a few years back when you were saying Holland (metal wise) you meant The Gathering, After Forever or some new artist with a band called Ayreon. 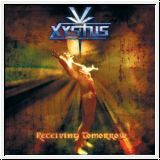 It took me a while to get to write a review for the young Xystus and their 2004 (or 2005 according to other sources) debut album Receiving Tomorrow but here it is finally. At first spin I was completely blown away by the production of the album; a quick look told me that the producer was Rob van Boeckel (who???) a guy that has never worked before with a rock band. Nevertheless this doesn’t seem to have stopped him achieving a stellar production and really come up with the best balance and sound allowing the band to display their talent to its highest capacity. Now don’t get me wrong, do not go and buy this album just to hear what a terrific production is all about. The album stands out not just by that but also mostly by the talent and the uncanny maturity showed by this quartet. A progressive metal album with excellent and original ideas, walls of sound, background keyboards, speedy and complex guitar riffing, astounding piano leads, quiet melodically interludes or intros, and an extremely tight and compact rhythm section (thanks to the van Dijk brothers) – Tim on bass and the very talented drummer Ivo who seems to be (at least in my opinion) one of the best Ulrich’s disciples. His drumming is in my opinion one of the highlights of the album, with excellent rhythm, always allowing the other players to develop or improvise from the main theme of each song and also moving and changing the pace effortlessly in a continuous flow making the music very easy to follow. A special mention goes to Bas Dolman (vocals/guitars) who, aside from making a very good guitar pair with lead guitarist Bob Wijtsma has a nice clean voice that fits perfectly with the compositions, adding to the catchiness of the songs. Journey: Shadow Of Today opens up with a nice progressive blend of guitars and keyboards setting the pace for the things to come. Into The Void is fast paced, guitar oriented metal tune, with an excellent staccato rhythm, with warm melodic voices and a background synth that turns into a keyboard pace shifter along with soaring guitar double solos. Elements’ Theme is an atmospheric intro to the next song Elements Of Truth, a bombastic and symphonic power track that mixes thoughtful score-like keys with powerful rhythm pivotal guitars along with good lyrics and Bas Dolman’s voice reaching higher levels. Next comes the Lost In Misery trilogy, an ambitious three part song with a nice quiet opening (Part I: A Tale Of The Heart) with good background chorus, emotional vocals combined with crystal clear piano and lovely atmospheric guitars. Part II: Will To Live On is a short introspective two minute piece of vocals over a piano layer morphing into the fast and furious Part III: Why Me? with raging guitars again supported beautifully by the synth wall of sound. Brilliant changes between the quiet parts with vocals/guitars and the thunderous double guitar leads with aggressive singing from Bas. Structure wise, this suite is very much alike with Kamelot’s Elizabeth trilogy from their 2001 Karma album. Everlasting Burden has a catchy chorus and a darker mood with less prominent keys and a solid composition. The Luring Red is an uncharacteristic and rather strange track with subtle changes of keyboard rhythm showing the more progressive side of the band. Excellent drum leads and powerful vocals complete the song. Forgotten Years is full and power and prowess again with speedy riffs and warm melodies. Approaching the end of the album, you can tell that the band and the producer have really made an effort to keep this album interesting and varied. The Prophecy is a catchy song with great drumming and the final track of the album A Waste Of Compassion is again a strong composition, with bursts of energetic drumming, excellent keyboard and guitar solos, extended instrumental bridges and powerful soaring riffs, a sum of all Xystus attributes. This band deserves your full attention and time to absorb all that it has to offer. They are young, they are skilled and they are original. If you’re looking for a band that fits into the New Wave Of Progressive Metal category, with a plus when it comes to melody and catchiness, look no further. With bands like this, the future for the progressive metal genre is set.